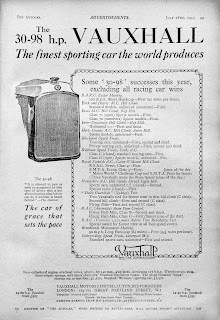 The Vauxhall 30-98, one of the greatest sports cars of the twentieth century and the first to top 100mph in production form, is marking its centenary in style this May, when almost 50 surviving examples attempt the Waddington Fell hillclimb, site of the car’s first appearance and competition success in 1913. Described as ‘The car of grace that sets the pace’, the 30-98 was derived from Vauxhall’s C10 ‘Prince Henry’ – acknowledged as the UK’s first real sports car – and was produced at a time when Vauxhall vied with Bentley in the prestige car market. But armed with a kerb weight 400kgs less than a Bentley 3.0-Litre, a powerful engine and high axle ratio, the 30-98 became renowned as a high-performance car that could swallow long distances with ease. This made it particularly popular with drivers in the colonies, and explains why so many cars still survive in Australia today. 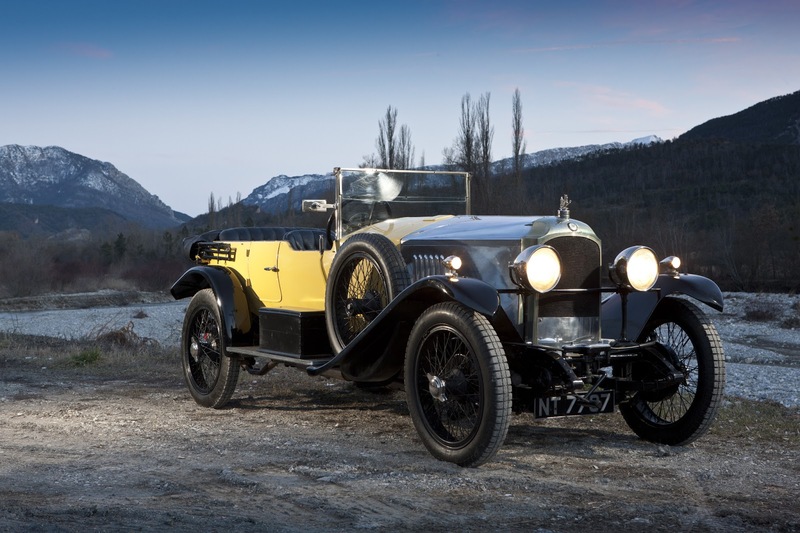 A precursor to the recently launched Cascada convertible, the 30-98 was actually developed in just 71 days, but went on to spawn a production run of 600 cars over a 14 year period (with a break for WW1). 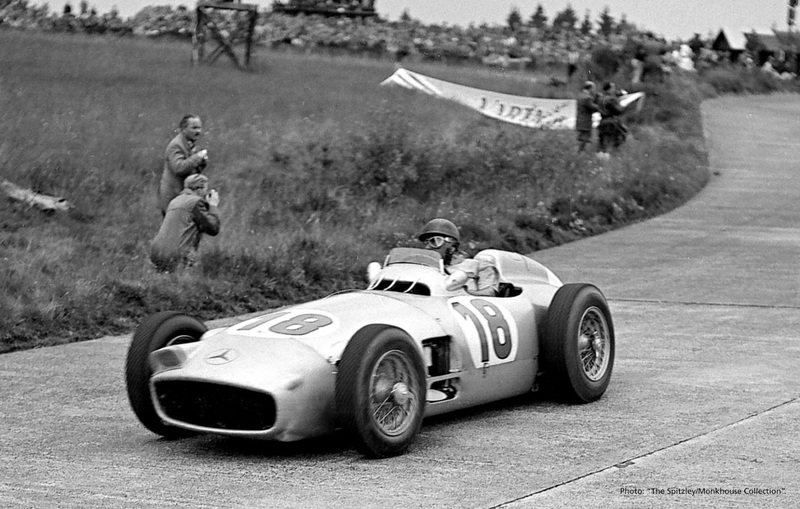 Remarkably, around a third of these cars still survive today. 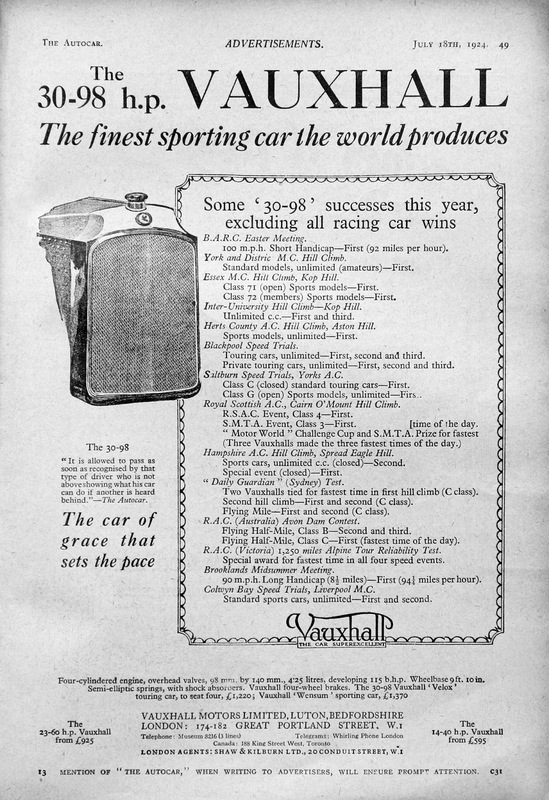 At a time when car manufacturers promoted the performance, durability and handling of their products through competition, Vauxhall had already been successful in hillclimbs, grands prix and endurance trials since the company was formed in 1903 (now celebrating its 110th anniversary, it’s the UK’s oldest surviving car brand). And the 30-98 represented the zenith of those achievements. On its first outing at the Waddington Fell hill climb in Lancashire, it set fastest time of the day, proving to the car’s designer, Laurence Pomeroy, and Vauxhall’s directors, Percy Kidner and Leslie Walton, that the car had a future, and production started in earnest. Originally fitted with a 4,525cc side-valve four cylinder engine, producing 90bhp, the model was made in two basic types: E-type and OE-type, with the latter denoting the more powerful overhead valve cars producing 112bhp, and built between 1923 and 1927. 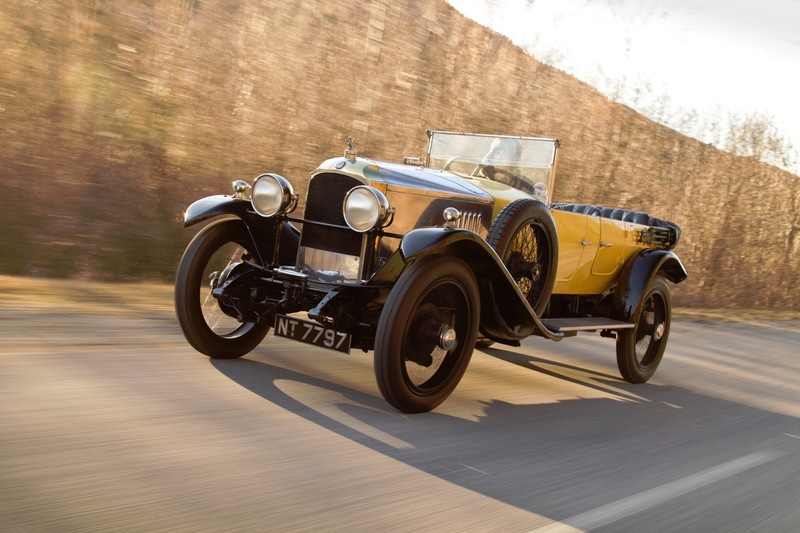 And it was the OE-type that became the first production car to exceed 100mph, partly prompted by a letter to The Autocar’s editor from a Major L.Ropner, complaining that he was unable to buy a road car that could cover a flying mile at more than 100mph! Vauxhall responded by producing a stunning two-seater 30-98 for him in polished aluminium, with a full set of road equipment. On March 28, 1923 factory test driver Matt Park took the car to Brooklands and achieved a flying lap at 100.7mph, before delivering the car to Ropner, who used it extensively for competition, continental touring and commuting to London from his home in Yorkshire. The British motoring press fell in love with the OE-Type 30-98, and in 1923 The Autocar subjected one to an early road test, recording a maximum speed (with standard Velox body and wind-breaking full windscreen) of 82.57mph – no mean feat at a time when most cars were struggling to top 50mph. 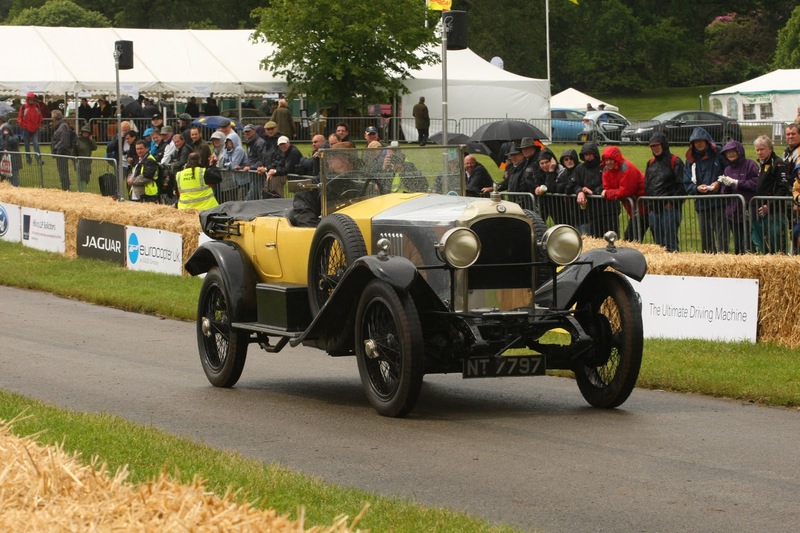 This year, Vauxhall Motors’ own 1926 OE-Type Velox Tourer (OE268) will join around 50 other 30-98s in Lancashire to celebrate the model’s competition debut at Waddington Fell. 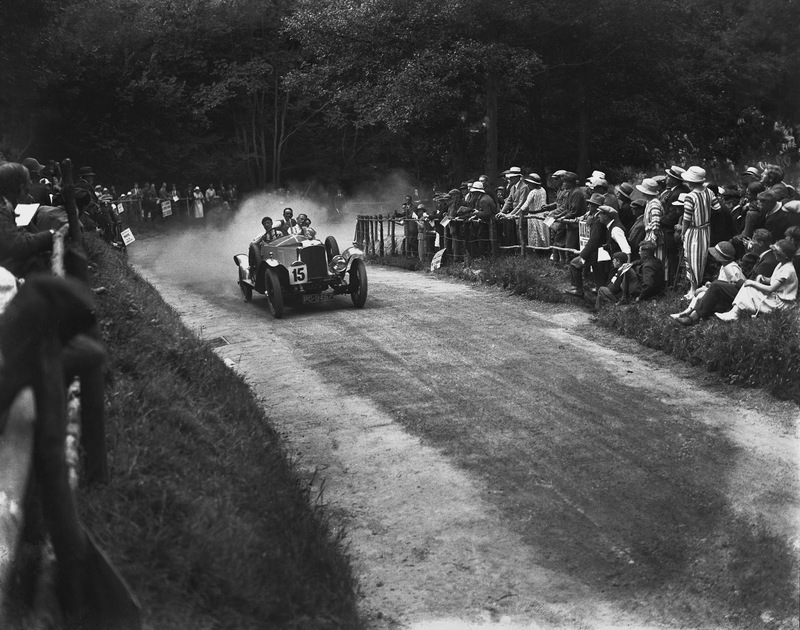 Working with the Vauxhall 30-98 Register, local authorities have closed the public road which used to form the course, allowing cars from as far afield as Australia and the US to recreate Higginson’s winning run. 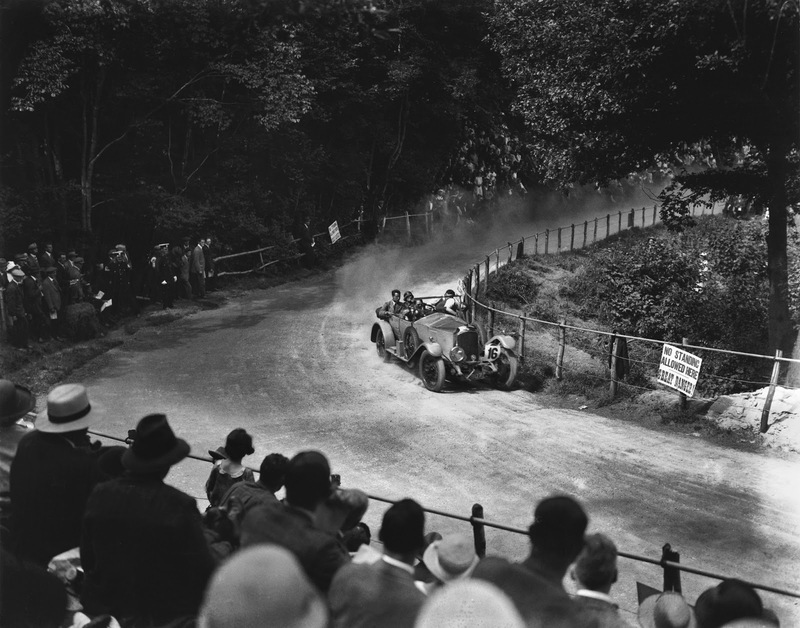 Goodwood has yet to confirm entry of the 30-98 in its centenary year at the Festival of Speed.